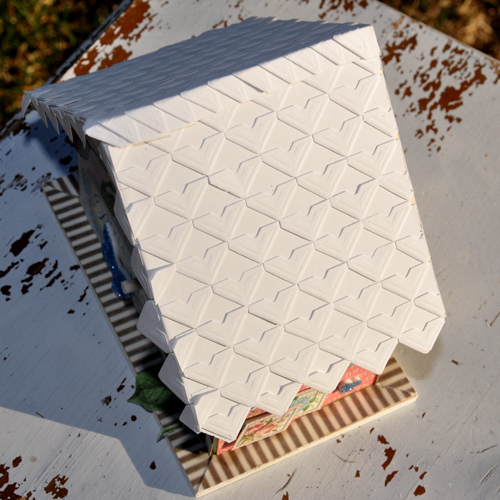 Hints of Spring are popping up all over, and I was inspired to create this Springtime Bird House. 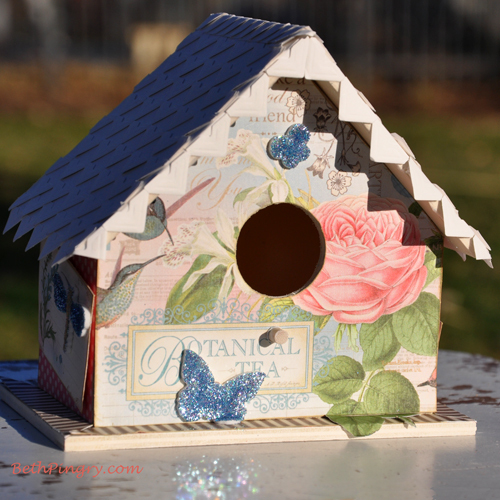 I found an inexpensive wooden birdhouse in the craft aisle of a big box store and I immediately knew what I wanted to do with it! 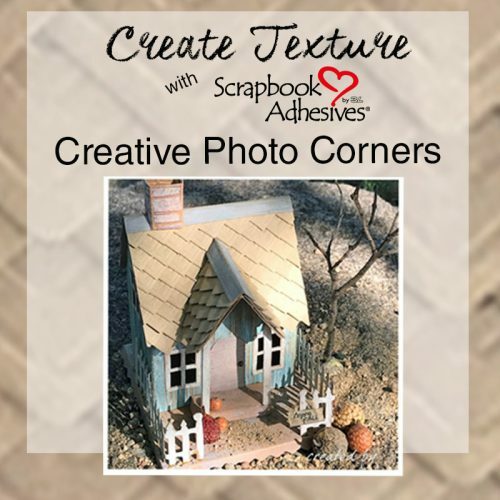 The roof line and shingles are all Creative Photo Corners, and they are easy to line up. They have permanent adhesive on the back side and so they stick beautifully! They feature a bit of embossed texture, which makes them even more interesting! 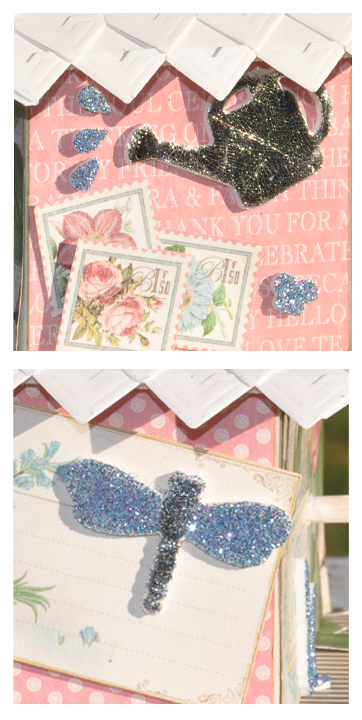 The 3D Foam Butterflies are covered in blue glitter and then adhered to the paper. On the side, there is a dragonfly, with wings covered in blue glitter and the body covered in silver glitter. On the opposite side I used 3D Foam Garden Shapes and covered the watering pail in foil. I have more photos on my personal blog, Cookies for Breakfast. Thanks for coming by today and Happy Spring!! This entry was posted in 3D Foam Shapes, 3D Foam Squares, 3D Projects, Adhesives, Altered Art, Crafts & Tutorials, Crafty Power Tape, Creative Photo Corners, Gifts, Home Decor, Mixed Media, Permanent Adhesive, Seasonal Craft Ideas, Spring, Wear your Adhesive on the Outside and tagged 3D Foam Butterflies, 3D Foam Garden Shapes, 3D Foam Squares Small White, Beth Pingry, Birdhouse, Clearsnap, Craft Foil, Crafty Power Tape 20' Dispenser, Crafty Power Tape 20' Refill, Crafty Power Tape 81' Dispenser, Creative Photo Corners White, Glitter, Graphic 45, Sparkle N' Sprinkle, Wear Your Adhesive on the Outside. Bookmark the permalink. 2 Responses to "Springtime Bird House with Creative Photo Corner Roof"
Wow, wow, woooow! The house looks amazing and the photo corner roof is spectacular! Wow this is the penthouse of bird houses how clever of you to use the photo corners for the roof great job all around!